The Kingdom Hearts series has always put a lot of importance into keyblades. 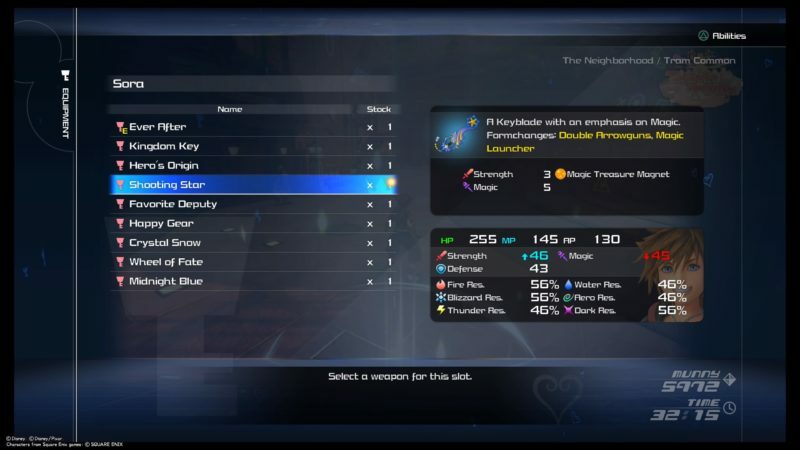 The main character Sora in Kingdom Hearts 3, is also a keyblade wielder. You will earn a new keyblade every time you complete a world in KH3. However, each keyblade has different stats and different formchanges. Which keyblade should you use for the final battle? Here are the top 10 best keyblades in Kingdom Hearts 3. Note: Classic Tone, Dawn Till Dusk, Phantom Green and Grand Chef are not included here. It was hard to choose the worst on this list, especially when you have Hero’s Origin as well (personally despite the formchange). After deliberating, Shooting Star makes no.10 on this list. This keyblade has a low strength but an okay magic stat. Its formchanges are also pretty mediocre IMO, with Double Arrowguns and Magic Launcher. Next on this list of best keyblades is Kingdom Key. I decided to put this in as it is the first keyblade that Sora wields, and you get it automatically in the game. The formchange which is Second Form enhances the attack of Sora for a short period, and is quite a decent skill if you’re good in combat. However, the strength and magic stats are pretty low. 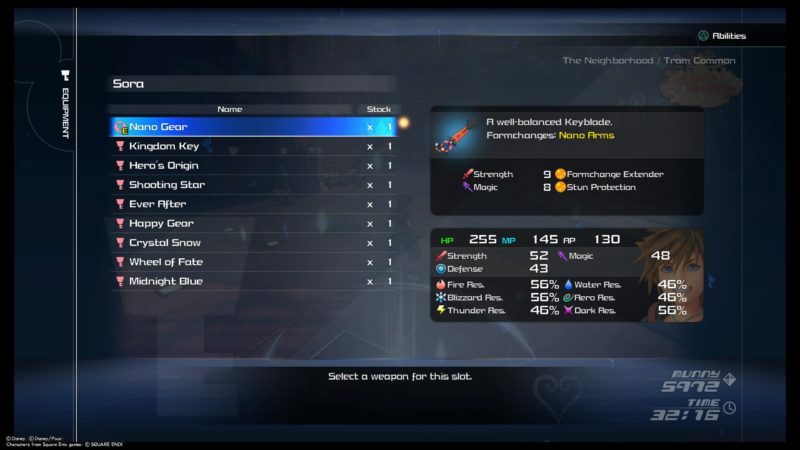 This Starlight keyblade is unlocked after you’ve completed Keyblade Graveyard, but probably before The Skein of Severance. It doesn’t have good stats – base of 4 each, but it is balanced in that way. The formchange is similar to the Kingdom Key, i.e. Second Form S.
Although you unlock this late game, it may not be the best keyblade for the final battle. You can however upgrade it to increase the stats. 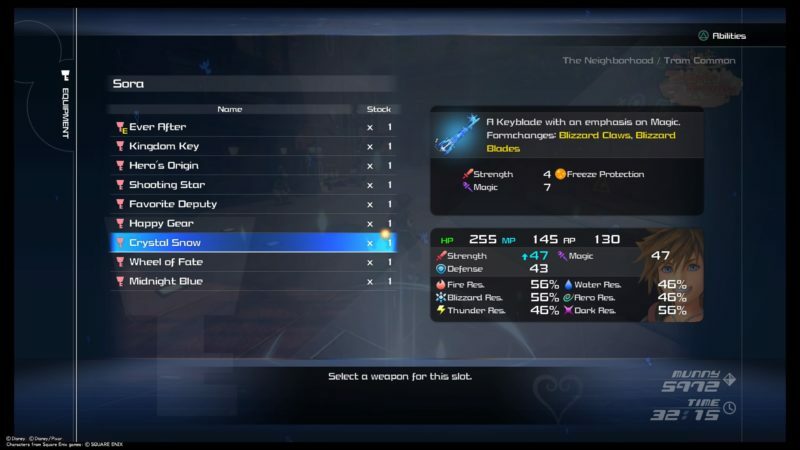 Crystal Snow is a keyblade you unlock after Arendelle. Its attacks are all icy in nature. The formchanges are Blizzard Claws and Blizzard Blades; both are pretty cool in attack. The damage isn’t too high, but the attacking speed is much faster during the formchange. While it has a low base strength, the magic stat compensates for it. It’s useful if you love using magic attacks. The next keyblade on this list is Favorite Deputy. Although you unlock this early on in the game (Toy Box), it’s quite useful even in the end game. It prioritizes heavily on strength, which is more apparent after you use the formchanges. The Hyper Hammer and Drill Punch served me well even in The Caribbean. They are good for one to one combat. That being said, the Hyper Hammer can be a little slow. Happy Gear comes in fifth place with its strength emphasis as well. It’s quite similar to the Favorite Deputy in terms of its stats. The formchanges Agile Claws and Twin Yo-Yos are also great strength-related skills that you can use against a foe or against many at a time. Its finishing move is pretty useful, but you need to aim exactly at the enemy before executing it, since the area of effect is small. Next up on the list is Hunny Spout, and this can only be unlocked after you’ve completed 100 Acre Wood. If you haven’t found that world yet, here’s how you can get to 100 Acre Wood. This keyblade comes with balanced stats between strength and magic. Its formchange Hunny Blasters is good for clearing many mobs at a time. That being said, I wouldn’t use it for boss battles. Now we’ve come to no.3 on this list. 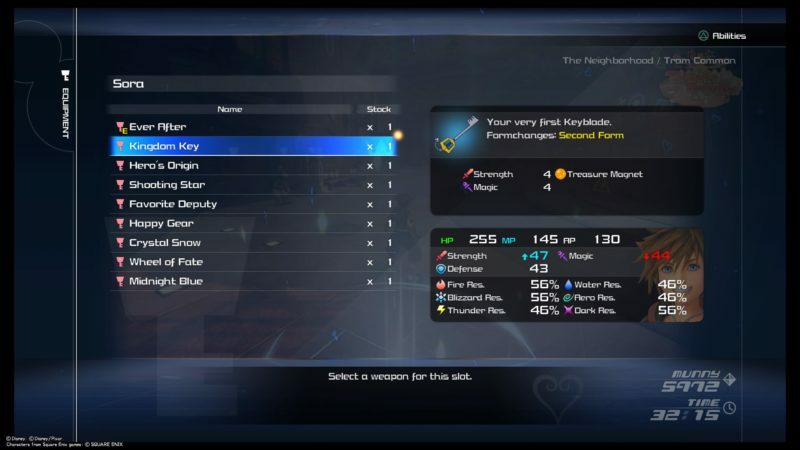 Nano Gear keyblade is unlocked after you’ve completed the world San Fransokyo. It’s one of the best balanced keyblade in Kingdom Hearts 3. The formchange Nano Arms is a really good strength skill for one on one combat. I personally used this keyblade to defeat the final boss of KH3. Its finishing which creates many microbot-spikes is also pretty useful, especially if you’re surrounded by enemies. Next up is the Wheel of Fate keyblade. You will get this keyblade after you’ve completed The Caribbean. It has the highest strength here, apart from the no.1 keyblade mentioned below. If you love direct combat with just your keyblade, then this one is suitable for you. The formchange Storm Flag is good for fast far-reaching attacks and the finishing summons a freaking Kraken made of water magic. What’s not to like? The most powerful keyblade in Kingdom Hearts 3 is, without a doubt, the Ultima Weapon. You can definitely beat the game without it, but it doesn’t hurt to have it. 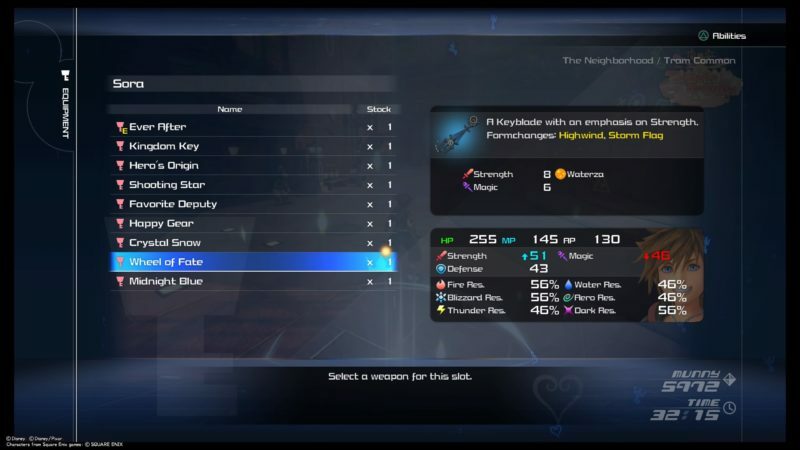 That being said, it’s hard to unlock this keyblade as you have to forge it. 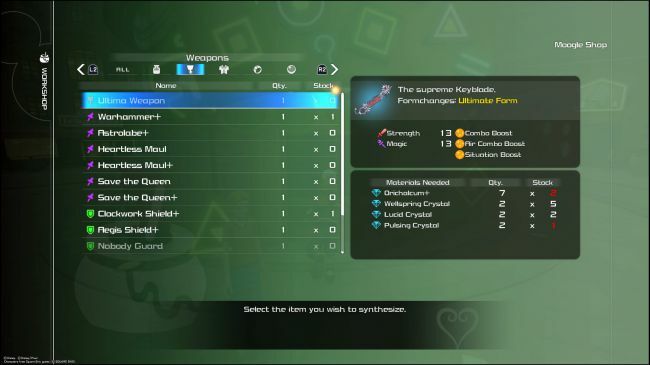 You will need to hunt for plenty of materials in various worlds just to synthesize the keyblade. If you do have it, use it. The formchange Ultimate Form is like a much better version of the Second Form you find in the earlier keyblades. Its finishing is also pretty cool, which summons a flurry of keyblades against the foe. What’s your favorite keyblade in KH3? 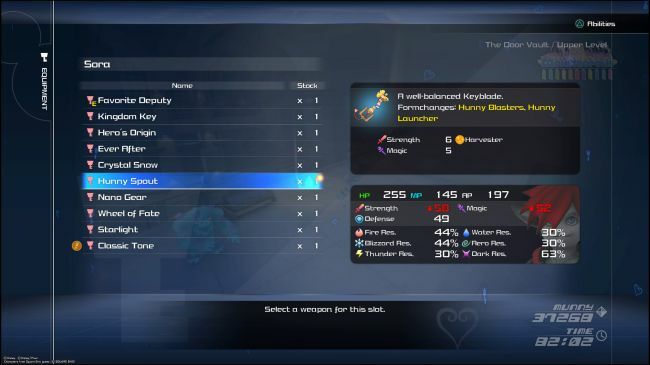 I’ve listed some of my favorite keyblades in this game. What are yours? Do leave your comments below before the comment box closes.